SCVHistory.com | St. Francis Dam Disaster | Survivors from the Edison Camp at Kemp. Survivors from the Edison Camp at Kemp. List of Edison Camp Survivors Given. Santa Paula Chronicle | March 14, 1928 pg. 2. 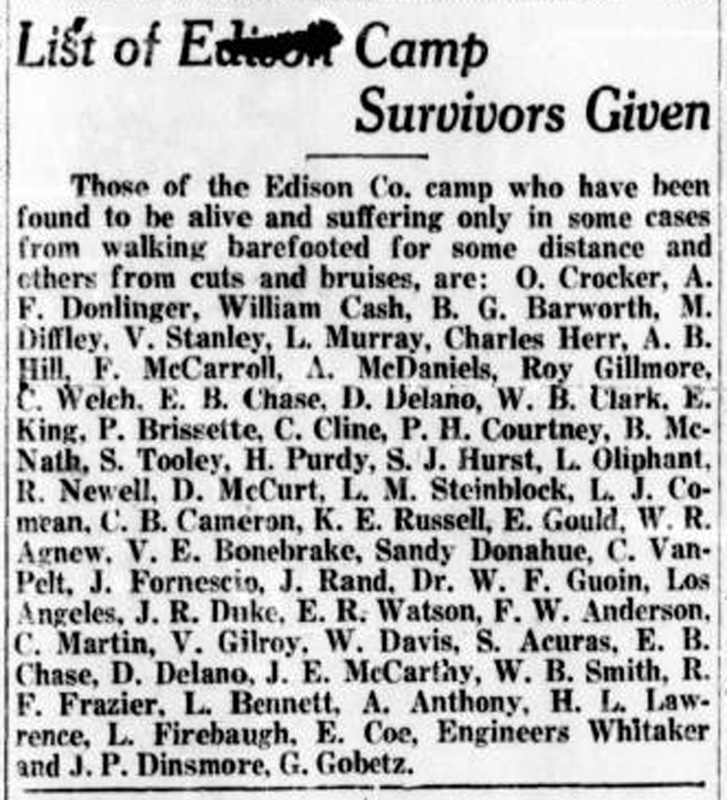 Those of the Edison Co. camp who have been found to be alive and suffering only in some cases from walking barefooted for some distance and others from cuts and bruises, are: O. Crocker, A.F. Donlinger, William Cash, B.G. Barworth, M. Diffley, V. Stanley, L. Murray, Charles Herr, A.B. Hill, F. McCarroll, A. McDaniels, Roy Gillmore, C. Welch, E.B. Chase, D. Delano, W.B. Clark, E. King, P. Brissette, C. Cline, P.H. Courtney, B. McNath, S. Tooley, H. Purdy, S.J. Hurst, L. Oliphant, R. Newell, D. McCurt, L.M. Steinblock, L.J. Comean, C.B. Cameron, K.E. Russell, E. Gould, W.R. Agnew, V.E. Bonebrake, Sandy Donahue, C. Van Pelt, J. Fornescio, J. Rand, Dr. W.F. Guoin, Los Angeles, J.R. Duke, E.R. Watson, F.W. Anderson, C. Martin, V. Gilroy, W. Davis, S. Acuras, E.B. Chase, D. Delano, J.E. McCarthy, W.B. Smith, R.F. Frazier, L. Bennett, A. Anthony, H.L. Lawrence, L. Firebaugh, E. Coe, Engineers Whitaker and J.P. Dinsmore, G. Gobetz. News story courtesy of Ann Stansell.